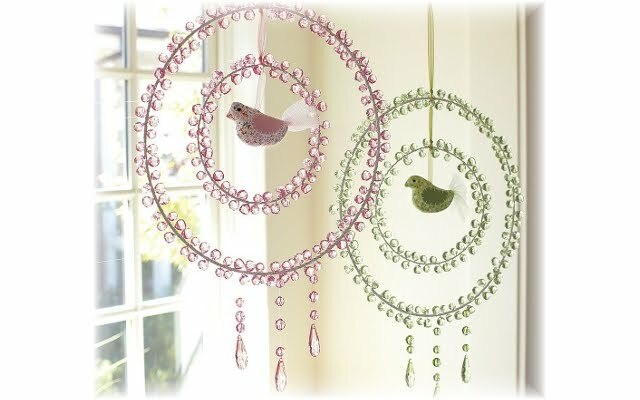 The word "elegant" is not what normally comes to mind when one is trying to describe a dream catcher, but that is exactly what this Potty Barn Kids Crystal Dream Catcher is. The product description uses the word "ethereal", which I also must agree with. Now I know these dream catchers were designed for a girl's bedroom, but I do think that they (especially the green) would look lovely in the window of a sun room, a kitchen, a breakfast nook, or any other room that offers plenty of sunlight. Each measures 19"H x 14"W and retails for $29. For something so lovely, I would certainly be willing to pay that price. If a blue were available, I would love to hang one in front of my kitchen window.